The Digitized Ramblings of an 8-Bit Animal: Disney Games On The NES: Man These Games Were Great!! 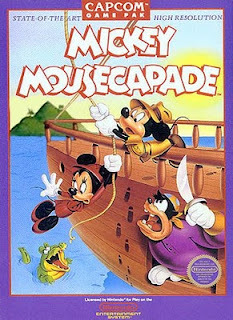 Disney Games On The NES: Man These Games Were Great!! Remember when Capcom had the Disney License? Most new gamer wouldn't, but us gaming vets remember being kinda geeked out whenever Capcom released a game based on a Disney cartoon. In my opinion, Capcom was one of the kings of the 8-bit system generation, and one of the reasons why was their licensing agreement with Disney to make games based on several of their more well known characters. It started off with a surprisingly tough game starring Mickey and Minnie Mouse. Mickey Mousecapade was ahead of its time in it's dual-character control mechanic. The success of this game led to Capcom releasing an NES game based on Disney's hit cartoon series DuckTales. In the game, you control Scrooge McDuck on his quest to retrieve a series of treasures from around the world, and in one level, on the moon. DuckTales was such a hit it spawned a sequel, and is still considered a favorite among gamers. 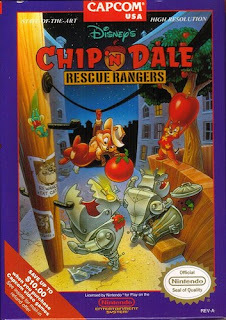 Capcom followed the first DuckTales game with what could be arguably one their best NES games (and that's saying a lot) in Chip and Dale's Rescue Rangers. this game featured two player co op gameplay (which was a novelty back then), a few of the mechanics borrowed from Super Mario Bros. 2, and that vintage Capcom toughness. it too spawned a sequel and is still immensely popular to this day. Capcom made a few other Disney games, including the great Magical Quest Starring Mickey Mouse, but they soon lost the Disney license. This explains why none of them are on the Wii's Virtual Console service.I suggest you dust off that NES in your attic and go hunting for all of Capcom's Disney games on the NES. They're old school gaming greatness that I higly recommend. Hell Disney games on the Super and Sega were great "The Lion King" "Aladdin" and there was a dope mickey games on the game gear but i forgot its name.